Every evening I turn on the news and far too often I witness another community in turmoil. It saddens me to watch the tear-filled interviews with those who’ve lost everything. Often left with nothing but the clothes on their backs. Grateful to be alive but wishing they’d taken time to prepared. Whenever I hear these words, I’m glad I took the time to prepare each of my family members a Go Bag. And even one for my pets! When I put my first go bags together, it was a great exercise in evaluating what’s really important in an emergency. Over the years the contents have changed, and I’ve rebuilt them several times over. But just months after moving into our new house, I stepped out onto the patio to find the sky full of smoke. We quickly loaded up the car with our Go Bags and the pets and checked the TV and radio for information. It turned out that we were never in any real danger. It was a grass fire on the edge of town that was quickly put out by the fire department. We can get out of our house in under 10 minutes, with all the critical gear, supplies, and documents we need to survive! So, what does it take to put together a Go Bag that can help you face an emergency? It can feel like there are so many things to consider that you’ll never finish. But like most tasks, it comes down to breaking your Go Bag plan down into manageable objectives. Then working through the plan step-by-step. First off, there are four critical objectives to take care of before you move on to the rest. They’re often referred to as the Rule of 3’s. These are resources that you will need in any situation and should form the core of your Go Bag checklist. You can survive for about 3 minutes without air. Even if you’re not cut off from air entirely, smoke, dust, pollen, and gases can make breathing difficult. At a minimum keep a few filter masks in your Go Bag to help clean up the air you inhale. 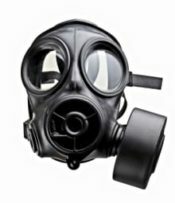 But if you’re worried about nuclear fallout or even chemical attacks – you’ll need a full-fledged gas mask. If you’ve got allergies or asthma, keep a supply of your medications or a spare inhaler in your go bag. Add an Epi-Pen if you or someone you know has an allergic reaction and can’t breathe. 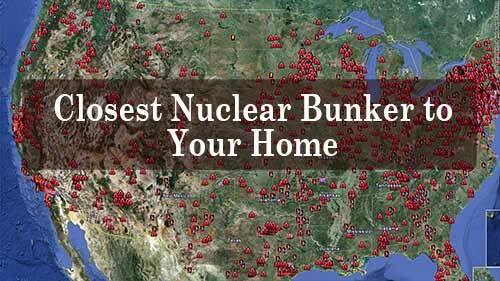 You can survive for 3 hours without shelter in dangerous temperature conditions. But in the most extreme environments, that number is reduced drastically. That’s why you should pack a survival blanket or a bivvy sack. These survival devices can mean the difference between life and death in bad weather. You could also add a tent hammock for extra comfort without adding too much weight. If you plan to travel with others, you can also look at larger group shelters such as a survival tent or even just a survival tarp. The TACT Bivvy is a simple lightweight survival blanket. It will keep you alive with its airtight mylar material; locking in your body heat even in the dead of winter. You can survive for 3 days without water. Water is critical for survival, so make sure you always have access to clean, safe water. I keep several single wall water bottles in my Go Bag (about a gallon total). The amount I carry is a personal choice based on the weight of water and our wet Pacific Northwest climate. I also carry a small survival water filter so I can refill bottles from any available water source. That way, I don’t have to only rely on scarce tap water. The Sawyer mini is both small but powerful. It can filter 100,000 gallons before it’s used up – that a whole lot of water! Sure, you can survive 3 weeks without food but who would want to? Your mental and physical performance will suffer quickly without energy. If you’re not keeping up with the calorie demands, you quickly enter an agonizing state of starvation. This can lead to poor decisions and fatigue when you can least afford it. So pack a few lightweight, freeze-dried meals and some calorie-dense snacks. These will help to keep your energy up and avoid full on starvation. There are plenty of products out there that provide a “full meal” in the form of a small bar. But I’ve found that most of them taste horrible and I don’t end up eating them. It’s worth it to try a few and see which ones you like best. I know it’s an emergency and calories are calories, but eating them shouldn’t be a chore. And remember, even survival food will eventually expire. So occasionally rotate your Go Bag food to keep it fresh. 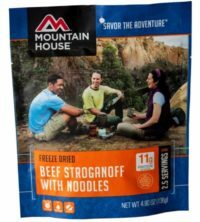 Our “go-to” recommended freeze dried food for bugging out is Mountain House. They allow you to add boiling water directly to the pouch – so you don’t need any extra bowls or cups for mixing or cooking. Saving you both precious ounces and space for other gear. Once you’ve got these four critical objectives handled, you can focus on the rest of the contents of your Go Pack. Again, take each of these objectives separately and work through them. These are still critical items, so consider each one and make sure you know how it fits into your plans. Weight is ALWAYS a factor since you’ll be carrying everything on your back. If there are lightweight versions of your gear, see if they present an advantage to trade up. Your clothes in an emergency can make a huge difference. Proper, high-quality clothing that will last is worth the investment. Environmental conditions will change the types of clothes you need, so it’s best to keep up with the seasons. For example, taking out the heavy winter coat in the summer means more space and weight savings. Keep a pair (maybe two) of durable gloves in your bag. They can be cold weather gloves, even in the summer. They won’t add much weight or take much extra space, and your hands won’t contribute that much to overheating. These can all injure your hands and leave you less able to take care of yourself. Worse yet, an infection could be the end if you’re not able to find any antibiotics! You often hear the head can lose heat faster than the rest of the body. That’s why I keep a baseball hat and a windproof fleece beanie in my bag. I can wear them separately or together, depending on whether I need protection from sun, cold, or both. A good waterproof jacket and tactical pants are a must. Don’t worry about getting ones with insulation, use layers underneath for warmth. This means your clothes will be more flexible across a broader range of conditions. They can also be useful for protecting your regular clothes from other wet, messy tasks. Tasks like cleaning game and working in wet conditions. Face it, you’re going to get dirty and wet at some point. You’ll have to change clothes to get clean and dry, as well as repair any damage. Keep a small sewing kit with your spare clothes. I like to swap out the cheap cotton thread in my kit for some lightweight fishing line. It’s more durable, and the repair is less likely to come apart later. Keep an extra pair of socks on hand, in addition to the one in your spare set of clothes. Full days of hiking can really do a number on your feet. That’s why you should swap your socks frequently to prevent blisters and trench foot. When you’re on the move, take the time to do it whenever you stop for a meal. You’re far more likely to remember it that way. And your feet will feel better when you have to shrug that heavy pack back on and start moving again. Get an excellent pair of hiking or combat boots. Something with waterproof Goretex is best. Hiking on wet feet for hours or days can lead to all sorts of foot troubles – the least of which is blisters. You don’t even want to think about trench foot! The bottom line is bugging out requires healthy feet – and good boots are the first and best line of defense. Humans are primarily a visual species. We process far more information with our eyes than any other sense. When the lights go out, everything becomes more difficult. Make sure you have a suitable light source – and a good backup. This is one place not to skimp. Look to the mountaineering community for the best in headlamps. These are no-compromise lights. They’re built for a sport where failure can be fatal and saving weight is paramount. A good headlamp will weigh very little and provide lots of hands-free lighting on each charge. A compact tactical flashlight is another excellent light source. It can serve as a backup light, as well as a weapon when needed. Chemical light sticks can be a reliable backup light as well. They have a long shelf life and can be used in any conditions. They work great as navigational markers and for signaling for help. The only downside, they can’t be stopped once you activate them. A lightweight solar LED lantern can also provide great in-camp lighting. These are ideal for tasks and group activity after dark. Now they’re not great for navigating in the dark. But they can give your headlamps and flashlights a break when cooking dinner or reading a map. 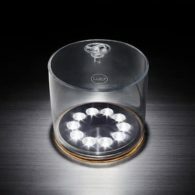 Luci Solar Lanterns are one of the best – both bright and lightweight! At some point, you’re going to get injured. Hopefully, it’s a minor cut, and you can clean it up and slap a Band-aid on it. Stock up on the daily consumables of life on the move – you’ll go through them faster than you expect. It’s helpful to keep a small day-kit in an outside pocket of your pack so since you may need these things frequently. Yes, it’s true, antibacterial drugs are creating more resistant bacteria. But in an emergency situation, that’s less of a consideration. Even normal bacteria can turn small cuts into life-threatening infections. So be extra cautious and clean any wound with anti-bacterial wipes. Bandages are so useful in an emergency they could become an alternative form of currency. Once your injury is cleaned, and debris removed, keep them protected with a bandage or band-aid. This helps to reduce the chance of infection or re-injuring the same place. Like anti-bacterial wipes, antibiotic ointments help keep wounds free of infection. Besides their antibiotic properties, most of them contain pain-relief ingredients. These can help manage minor pain associated with cuts and scrapes. Speaking of pain relief, be sure to include some medications for pain management. Ibuprofen and aspirin are the go-to over the counter drugs. Although naproxen sodium (Aleve) works well and is longer lasting. It’s not a bad idea to keep a small tube of an oral painkiller (Orajel) as well. It can be a HUGE relief if you chip a tooth or cut your gums. Again, take care of your feet (that can’t be said enough). You’re going to get blisters and hotspots from your boots at some point. Keep a pad of moleskin in your day-kit to patch up your feet on the move. If you take daily meds, ask your doctor for an extra prescription for your disaster supplies. Make sure to rotate them, so they don’t expire. If it’s a serious or chronic ailment – you’ll appreciate having a well-stocked first aid kit. These are the items you pull out in a real medical emergency. Keep your kit organized and labeled so you can find anything you need quickly. Latex gloves help keep wounds clean and prevent contamination. Because soap and water for clean up will not be easy to come by. Gauze pads are incredibly useful when attempting to stop bleeding. Don’t be afraid to use several layers of gauze if the bleeding is hard to contain. Keep lots of pressure on the wound, whether by hand or with a compression bandage. Triangle bandages are large swaths of cotton cloth used for deeper cuts, or scraps. The SAM Splint is a sandwich of foam and lightweight aluminum. These can be formed into a nearly infinite range of splints for every body part. Light and effective – perfect for a bug out bag. Tourniquets have come a long way since the old fashioned belt-around- the-arm. Modern tourniquets are easy to use and far more effective. They’re lightweight and can save a life in a serious accident. But, they’re also a tool of last resort since they stop blood flow to an extremity. If it’s left on for a long time, the limb may need to be amputated. Also, once you put them on, they can’t come off without serious risk of shock. Shears, scissors, forceps, and tweezers help with medical incidents from small to catastrophic. Stock extra safety pins and tape as well, since you’ll need lots to secure bandages in an emergency. Even if you know the local area, it’s a good idea to keep some navigational tools ready in your Go Bag. If if you know the area like the back of your hand, you might have to look up something up. You also might need to communicate plans to others who don’t have a mental map of the land. I have a standalone GPS in my Go Bag, loaded with all kinds of maps – but it’s only a backup. Generally, I use one of several GPS apps on my smartphone. Cell phone GPS antennas will work even without any cell service. The app is more user-friendly, faster, and has a broader range of map layers I can choose from for my local area. If I’m worried about phone battery, I can always fall back on the stand-alone unit. These GPS devices last days on a single set of batteries. A large paper map of the area can be indispensable when coordinating with a group of people. Knowing the backroads and alternate routes might be useful after a disaster. Finding water sources might lead you to ponds you’ve never noticed before on the topo map. It’s a good idea to keep a map that covers the whole region, in case you have to evacuate further than planned. Learn how to use a compass before you trust your life to it. Once you know how to use it, a map and compass is an efficient and lightweight navigation setup. No batteries, no satellites to worry about. They’re harder to use at night, but with skill, it can be done. We all hope we don’t have to defend ourselves from threats – either human or otherwise. But it’s not realistic to think that every encounter will be a friendly one. 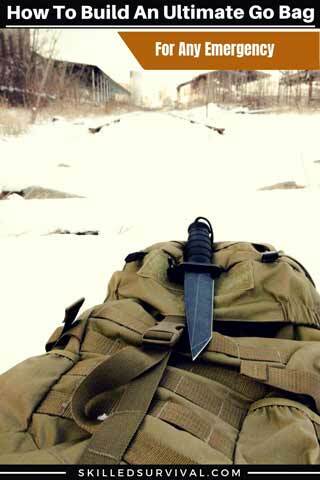 A trusty survival knife can be both a defensive weapon and a multi-tool. Look for one with a full tang and a solid steel blade. Learn how to maintain the edge and keep a knife sharpener with your other tools. While Bowie and tanto blades look impressive, I’ve always been a fan of a drop point blade. It gives you a long cutting edge in a shorter blade and makes for smooth cuts. Capsaicin bear sprays are effective on both animals and humans. They’re a decent stand-off weapon to keep your attacker out of reach. If your EDC includes a firearm, be sure to add some extra ammunition to your Go Bag. Even if you’re fortunate enough to have good weather, you’re still going to need to stay warm. Every Go Bag should contain at least one tool to make fire. Waterproof matches are a good start, as well as a survival lighter. I keep them in separate waterproof bags just in case. You might not always find good dry kindling. “Magic Biscuit” fire starters are easy to make at home. They’re nearly indestructible and can help start a fire in the worst weather. Chemical hand warmers are cheap and easy to find. They provide low-safe heat for hands or feet while you’re on the move and can’t sit by a fire to warm up. A portable stove and cookware can help keep you fueled up and warm when a campfire isn’t an option. There are lots of tools that fall into several different categories. But these multi-purpose tools can be priceless in a disaster. A small hatchet or saw can make lots of tasks easier; from collecting wood to building shelter. Plus, the back of the hatchet serves as a great mallet to pound in tent stakes. And the saw can help clear vegetation to build a camp. Either one makes an excellent improvised survival weapon in needed. Of course, a survival multi-tool should be in your pack, if not your EDC. There are endless possibilities for paracord in a survival situation. Pack a long coil of paracord for hanging bear bags. You can also use it for building survival shelters. The inner strands can be plucked out and used for fishing line or to create invisible snares for small game. If it can’t be fixed with duct tape (or my favorite Gorilla Tape), it can’t be fixed. Wrap a couple yards of tape around your water bottle instead of the whole roll. That way, it’s more compact, and you’ll always know where to find it. Finally, all the rest. There are always things that don’t really fit into any category. They can slip through the cracks, so we added a category just for them. From flashlights to GPS units to cell phones, there’s going to be a decent amount of technology in your Go Bag. All worthless devices without electricity. So be sure to add a solar charger and battery pack if you depend on any of those items. Make sure to include the cords for each device! Skilled Survival recommends the EasyPower Solar Charger. It’s the one our chief editor (“Just In Case” Jack) carries in his Go bag. A loud survival whistle is an excellent means of signaling for help. Pack a high-powered whistle that works even in bad weather. At the top of the list, we mentioned dust, smoke, allergens, and other particulates. These are bad for your lungs, and I suggested packing a gas mask. The same thing applies to your eyes – so make sure to protect them from irritation with goggles. I have a pair of clear ones in my Go Bag, but I swap them out for ski goggles in the winter to protect my eyes from snow blindness. If the power is out, your credit card isn’t going to be worth much. Save up a small amount of extra cash and keep it in your Go Bag. A couple hundred dollars isn’t unreasonable. Make both a paper and electronic copies (on a flash drive) of all your important bug out documents. Keep them in a sealed bag in your pack. The originals can remain in a fireproof home safe or a bank safety deposit box. Photo inventory of your home. A photo inventory of your home can be invaluable for insurance claims. Titles and Deeds to your house, car, and any other essential loans documents. Addresses and Phone Numbers for all your contacts. Your phone may not be functional, so a hard copy of the address book is a good backup. Once you’ve got your packing list sorted out, and your supplies gathered, take time to find a quality pack. It should be organized, durable, and comfortable – since you might be wearing it for a long time. Be careful not to get too large a pack. It’s tempting to have the extra space, but you’ll just fill it with more stuff and weigh yourself down. 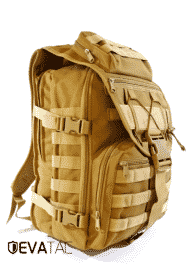 One bag that has all this and more is the EVATAC Combat Bag. It’s the bag of choice for our Skilled Survival founder “Just In Case” Jack. Here’s a video of Jack reviewing this excellent go bag. It’s a solid bag at a very affordable price point – it’s doubtful you’ll find a better bag at that price. If this looks like a tremendous amount of stuff to sort out, don’t worry. Work through each category one by one, and you’ll have a great start to your Go Bag. As time passes, you’ll think of things that you want to include and find other things aren’t as useful for your plans. Edit your list as you go to reflect these changes. Remember, preparedness is a process, not an end result. You talked about pets. Would this be included in your bag or do they have their own? Do you have a good go bag list for pets? Ideally, they have their own. There are lots of packs for dogs. Pets don’t need much – food and water mainly.